Spirit calls to me - at the wee hour of 4 AM, as I write from a brightly lit hotel bathroom in Ashland, OR (as to not bother my traveling companion.) I watch the night fog envelop the tops of the village below. Two people living at the same moment in time walked through the same doorway into the same building. Two people met the same group of people for the same period. One person had an experience of love and light, while another person experienced a scenario of fear and darkness. There are those of us who are living joyously in the higher dimensions already, either, sometime, or most of the time, and our goal is to stabilize that joy so that we can live and view life continuously from this higher vantage point. As Neale Donald Walsch says in Conversations With God, this is our choice; either to live in fear and darkness, or to live in love and light. This was the focus of the scene that was shot one long day on the set of the CWG movie. I was in Ashland, Oregon to be an extra in the film. It was an interesting adventure for me as I had never been to the Northwest before nor been in a movie, let alone a spiritual one. Throughout the two day shoot I took part in, my friend and I were amazed by the pleasant experience this was for us and for a group of about 400 extras. The registration of extras was orderly and fairly fast. We were all treated warmly and graciously. The extras were thanked many times throughout the day for their help in shooting, even though our roles were very minor. 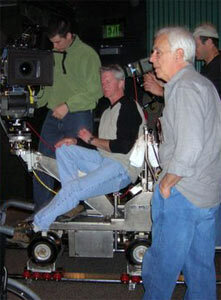 An atmosphere of fun and learning about filmmaking was promoted as Stephen Simon, the Director, described what was happening during filming and why various shots were being repeated. We were all coached for our audience parts in a fun way. Stephen Simon also told many tales about filming the movie, and answered a great number of questions throughout the day from the extras as time permitted. It was such a fun experience. The books and CD’s I brought to pass the time waiting – as was suggested – went unused. Later after shooting, in front of a retro movie theater, my friend and I ran into some crew members from the shoot. We introduced ourselves and asked them questions about the filming. From the start of our conversation with them all they could talk about was how they were being cheated and that the management was mean. One man then went on to regale that this movie was no better than working on What the Bleep, which he also participated in. My friend and I were shocked and dismayed to think that the movie making project we had such a wonderful experience with, could really be one of such a low vibrational level. As we continued to meet more people and crew members out and about, we kept running into wonderful positive helpful people with the Conversations With God movie. Was it possible that four people attending the same event encountered such diametrically opposed experiences? Is it more probable that the vibrational perspective we each carried into our lives, really affected our interpretation of the experience either positively or negatively? What I think happened is that God sent these two crew men an express train with a choice to live in joy, and to receive a spiritual message. The train stopped in front of them, the doors opened, but they just watched it speed on without them. As we choose each moment, each activity, and one’s relationships – which doorway do we choose to go through? There is a doorway of love, Light, oneness and joy – but one must choose it. Yes, I suppose I see the world through rose colored glasses much of the time, but I really believe you too can choose to live your life as heaven on earth right now, no matter what outward appearance may be to others, in this lifetime. All I know is that as the express train to joy stops for me, I expect to be aware of it, to step boldly on and to enjoy the ride. And I hope I will see you in my journey!